Provide your child invaluable real-world experience by paying them below the poverty level for their manual labor. Require a PowerPoint presentation detailing projected quarterly profits before you agree to invest any of your capital in powdered lemonade mix. Simulate the free market by having all of your children compete for a single allowance. Demonstrate the importance of proper savings by repeatedly overdrawing your family’s checking account and suffering devastating ulcers as a result. 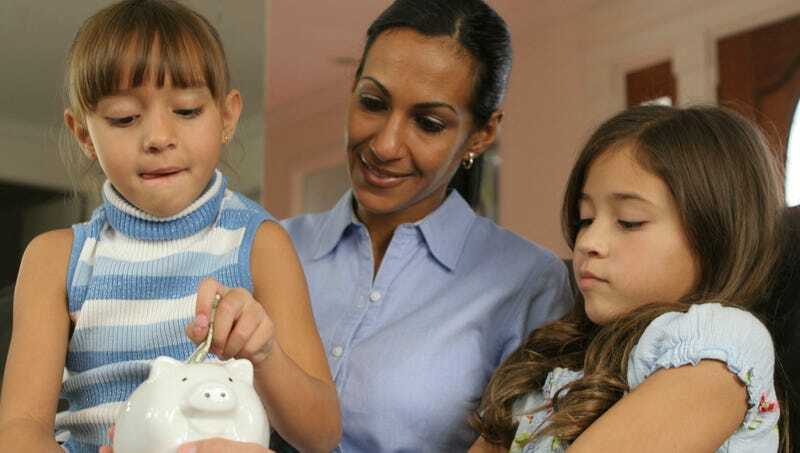 Get your child excited about personal finance! Make some fun fake currency out of colorful construction paper and have your child put it in a pretend high-interest CD that they can’t touch for five years! It might seem like a lot of work now, but investing a little extra time will ensure you find the translation of Marx’s Das Kapital that’s right for your kids. Make sure you’re very clear with your college-bound teen about the long-term risks of accumulating credit card debt, as they’ll have to weigh your warnings against the benefits of Capital One T-shirts and Frisbees. Personal accountability is key. Remind your child that although you pay their bills now, they won’t be 33 forever.